Hydrocephalus can present with acute or chronic symptoms at any age. Obstructive and communicating hydrocephalus are the two main types. In adults, the most common form of the latter is normal pressure hydrocephalus (NPH) with a mean age at onset of about 70 years, equally common in both sexes. This review will focus on the idiopathic variant of the disease (INPH), the typical features of which are imbalance, gait disturbance, urinary symptoms, and cognitive decline. Although the treatment is surgical, by placing a cerebrospinal fluid (CSF) shunt, neurologists are essential for diagnosing patients with gait disturbance and/or ventriculomegaly, for preoperative selection of shunt candidates, and to optimise the CSF shunt system postoperatively. Very little is known about the incidence and prevalence of INPH. In a door to door survey in people older than 65 years, 0.7% of the population had Parkinson’s disease and 0.4% NPH.1 In Sweden, between three and six shunt operations in adults per 100 000 inhabitants are done every year at the six neurosurgical centres, about 30% of which are for INPH and 20% for secondary NPH.2 The pre- and postoperative investigation of INPH is the fourth most common diagnosis after stroke, epilepsy, and headache at the neurology inpatient service at our hospital. There are few neurological conditions where treatment has such a large impact on outcome as INPH. The patients are elderly and even a small improvement in their gait or activities of daily living has the potential to substantially increase their independence. In most countries hydrocephalus is considered a “neurosurgical problem” without any need to consult the neurologist. But we believe that a multidisciplinary approach with the neurologist and neurosurgeon in fruitful cooperation is what is needed. An important issue for the general neurologist is the evaluation of patients referred because of gait disturbance and/or ventriculomegaly. It is of vital importance to perform any shunting as soon as possible because the chance of a good outcome decreases with progression of disease.3 A dedicated neurologist is needed for the preoperative selection of whom to operate on, while the neurosurgeon is responsible for the surgical procedure and the postoperative care, as well as any shunt revisions. At follow up visits, the neurologist should evaluate the success—or not—of surgery, exclude shunt complications, and if necessary adjust the opening pressure of the CSF shunt. IDIOPATHIC NORMAL PRESSURE HYDROCEPHALUS: MYTH OR REALITY? The silicone CSF shunt valve was introduced in 1952 and six years later the first operations on hydrocephalic patients with normal intracranial pressure were performed, although not published until 1965.4 The successful results led to the recognition of normal pressure hydrocephalus. A distinction between idiopathic and secondary NPH was suggested in 1975.5 Because of the name, it is often assumed that INPH patients have normal intracranial pressure (ICP). However, the term normal pressure hydrocephalus is misleading because the ICP is on average slightly higher than normal (fig 1).6 We prefer the term idiopathic adult hydrocephalus syndrome, which was introduced by Ekstedt in 1989, as a more correct description7: the ICP is slightly increased, it is a syndrome with a specific definition, and it affects adults. Intracranial pressure (ICP) in INPH and healthy elderly, calculated at equilibration, about 30 minutes after insertion of the needle.6 The boxes show the median values and the interquartile range, the whiskers the outermost data points. INPH was initially described as a treatable dementia and many assumed that CSF shunting would ameliorate the symptoms in most patients. Shunt surgery became the accepted wisdom despite the lack of any scientific evidence. However the diagnosis, as well as the effectiveness of surgery, has been questioned and a Cochrane Review concluded “there is no evidence to indicate whether placement of a shunt is effective in the management of NPH”.8 On the other hand, a recent guideline committee states “surgical diversion of CSF is recommended for INPH patients in whom there is a favourable risk-benefit ratio”. 9 The reason for this discrepancy is that the outcome of shunted and non-shunted INPH patients has never been compared in a randomised controlled trial. However, we feel that with a clear definition of INPH followed by robust investigation, doubts about the usefulness of CSF diversion can be removed. Of course, as the patients get older, the long term results will be influenced by age related comorbidity. In one study of 42 shunted patients (mean age 72 years) 64% had improved three months after the operation and 26% remained much improved in gait and activities of daily life at three year follow up.19 However, the mortality among INPH patients was about three times greater than a general elderly population, the deaths mostly being the result of vascular disease, although a small number of patients experienced serious shunt related complications. Unfortunately, many conclusions are vague or unreliable in hydrocephalus research because of methodological limitations. Idiopathic cases often are lumped together with secondary cases despite their different aetiology, age, and prognosis. The studies are often observational and more often retrospective than prospective. Inclusion and exclusion criteria differ between different studies. There is a need for a widely accepted definition of the syndrome in order to include homogeneous patients in future study populations. The outcome measures have always been focused on absolute improvement from shunting; little is known about whether surgery can affect the progress of disease in shunted patients without postoperative improvement, or whether a shunt in a patient with minimal symptoms can prevent further deterioration. This kind of research requires control groups. Another important issue is to increase the objectivity of the pre- and postoperative assessments. The CSF is a dynamic system: the brain environment is affected by the formation rate of CSF, the outflow resistance, venous pressure, compliance of the craniospinal system, and variations in ICP. When these are not in balance hydrocephalus results and the clinical syndrome of INPH (fig 2). The causal relation between abnormal CSF dynamics and the symptoms is supported by the observation that patients improve after shunting. Therefore, clinical improvement can be accomplished by changing the brain’s environment—that is, the CSF dynamics. INPH can be explained by the hydrodynamics of the CSF system (including any shunt) which create the working environment of the brain; deteriorating brain function due to the disturbed environment; and so reversible clinical symptoms due to impaired brain function. 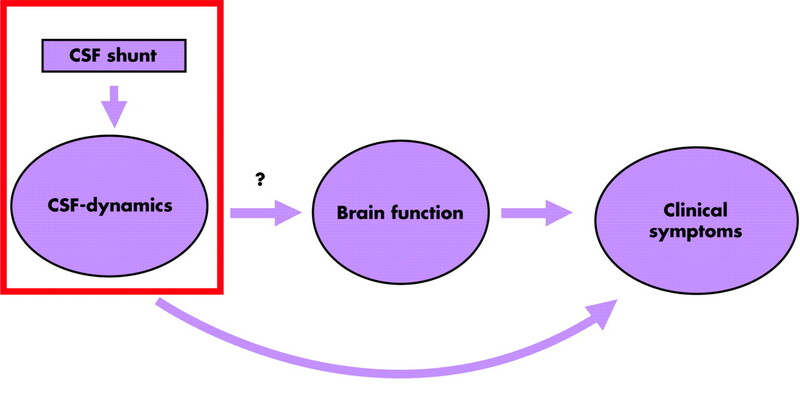 The question mark indicates the missing link between the hydrodynamic environment and brain dysfunction. Most of the research in this field has followed the curved arrow as it has been shown to develop predictive tests for a good outcome after shunting. Intracranial pressure is the most easily accessible marker of the balance produced by these properties, and is defined as the counter-pressure that has to be applied to a needle placed in the CSF system in order to stop CSF flow. When clinicians are discussing an ICP value, measured intracranially or via the lumbar space, they are usually referring to a static pressure—that is, the mean ICP. However, the ICP varies continuously around the mean due to physiological periodic variations, for example originating from changes in blood volume resulting from the heartbeat, and also from vasomotoric waves with a duration of minutes. The magnitude of the ICP fluctuations in relation to the volume variations is described by the compliance of the craniospinal system. A grand unified theory explaining the pathophysiology of INPH has yet to be proposed and validated (fig 2). It must explain the development of hydrocephalus (the working environment of the brain), the symptoms of the patient (their brain function), as well as why these symptoms are improved by a CSF shunt. A hallmark is the disturbance in the CSF dynamic system and one of the most concordant findings is high resistance to CSF outflow (Rout).6, 12, 24 A relation of Rout to the ventricular enlargement is plausible, although the mechanism has not been clarified. It has however been shown that a CSF shunt converts the pathological high Rout into an extremely low value.25 Other disturbances in the CSF dynamic system are listed in table 1. The symptoms of INPH are more and more recognised as being caused by a complex interaction between a CSF dynamic disturbance and cerebrovascular disease, mainly affecting the periventricular deep white matter.34 In INPH, the frontal horns are pathologically widened, and there are axons in the white matter in surrounding parts of the brain.35 This area is supplied by the small perforating end-arteries creating boundary zone territories sensitive to ischaemia.36 Thus, the predisposing causes of the syndrome include vascular disease, arterial hypertension,36 decreased cerebral blood flow, and ischaemia36–41 (table 2). WHAT SHOULD THE NEUROLOGIST LOOK OUT FOR? Because decline in balance, gait, or memory are some of the most common neurological complaints in the elderly population, it is a challenge to diagnose the occasional case of INPH. The diagnosis (table 3) is based on the clinical symptoms, radiological features, and the exclusion of other diagnoses. Gait disturbance is the cardinal feature and a mandatory symptom, almost always preceding the development of other symptoms.6,44 The patient may or may not have mental impairment and/or urinary symptoms. If the history and the neurological examination are more or less consistent with the diagnosis, the patient should have a CT scan, and if this reveals communicating hydrocephalus the patient should be referred to a hydrocephalus group or a neurosurgical department. In table 3, we have also brought together signs and symptoms that make the diagnosis less likely in certain patients. However, many of these patients may still have the potential to improve following surgery. Historically one diagnostic criterion for INPH has been improvement after shunting. In addition to being impractical, this criterion can be wrong because the disease may have reached an irreversible stage with no chance of postoperative improvement despite a correct diagnosis and a functioning CSF shunt. The diagnosis must be based on preoperative evaluation, not the result of surgery. A careful patient history is of utmost importance and if there is any cognitive decline, the relatives should be interviewed as well. An INPH patient almost always begins with balance and gait disturbance44 whereas in other dementias similar symptoms are preceded by pronounced cognitive decline. A common opinion is that the results of surgery are less favourable the longer the duration of symptoms.19 For instance, dementia lasting for more than two years has been considered a bad prognostic sign.45 Patients with NPH caused by subarachnoid haemorrhage, traumatic brain injury, and bacterial meningitis should be excluded by the history, and diagnosed as secondary NPH. Few studies have compared INPH with healthy elderly, Binzwanger’s disease, or Alzheimer’s disease patients.50,52 Thus, it is difficult to provide a specific neuropsychological profile53 but INPH is often classified as a subcortical dementia. Characteristic cognitive features are memory loss, slowness in thought and in processing information, difficulty in planning, and mental shifting.54 There is also decreased attention and visuospatial disturbances. Frontal lobe dysfunction50,55,56 has been suggested. Most neuropsychological data come from before and after shunting but of course these cannot be used to predict the surgical outcome. Although urinary frequency and urgency are common problems and one of the main features, these are very common in the elderly and anyway incontinence is a late symptom in INPH. Thus, these symptoms are too non-specific for standalone diagnosis. Nonetheless, because urinary symptoms often improve following CSF diversion, they are important to ask about in the preoperative evaluation. A CT or MR brain scan should be performed in any patient with symptoms and signs compatible with the diagnosis of INPH. Although a CT scan will reveal the ventriculomegaly, an MR scan is mandatory before surgery57 to exclude obstructive hydrocephalus. Ventriculomegaly is a cardinal feature of INPH and the degree can be defined by an Evan’s index greater than 0.3 (fig 3). Other important findings are flattened cortical sulci in the top slices of the scan, and widened temporal horns (fig 3).58 Sometimes there is focal dilatation of the cortical fissures and sulci.59 CT scan can also reveal the degree of any cortical atrophy and previous cerebrovascular events. Cortical atrophy is not an absolute contraindication to surgery, but should raise the question of Alzheimer’s disease. Preoperative (left) and postoperative (right) CT brain scans. The ventricles are widened and the cortical sulci in the top slices are flattened, less postoperatively. Evan’s ratio is calculated as the ratio of the greatest width of the frontal horns of the lateral ventricles (A) to the maximal internal diameter of the skull (B). Observe the tip of the shunt catheter in the postoperative images. Among patients admitted to our hospital because of communicating hydrocephalus on CT scan, or clinical suspicion of INPH, 60% do not have INPH and 20% are diagnosed with INPH but not operated on because of minor disability, operation is refused by the patient, or severe dementia.6 Thus, only one in five admitted patients is suitable for surgery. As most of the differential diagnoses are non-surgical, a neurologist is probably best suited to select the proper surgical candidates. The first diagnostic issue concerns other forms of hydrocephalus. All types of hydrocephalus, irrespective of aetiology, may present with disturbance of balance, gait, and cognition. Patients with aqeduct stenosis may have the same clinical features as INPH.60 Of course, many of these patients should have surgery, but the aetiology, investigational methods, as well as treatment options and prognosis, are different from INPH. The second issue is to exclude other types of dementia such as subcortical or vascular dementia (Binswanger’s disease) and Alzheimer’s disease. Keep in mind that although gait disturbance often is the first symptom of INPH and that other forms of dementia can be accompanied by balance and gait disturbances, these are generally not until the advanced stages. Most clinical features as well as MRI findings of a patient fulfilling the diagnostic criteria for vascular dementia can also apply to a patient with INPH and “mixed” cases further complicate the diagnostic problem. A diagnostic rule is that extensive leukoaraiosis is more common in vascular dementia, and dilated ventricles are the hallmark of INPH. In addition, patients with vascular dementia often have a history of stroke and focal neurological signs such as hemiparesis. The third diagnostic issue is to exclude gait disturbance caused by other problems which are common in the elderly such as pain, polyneuropathy, and myelopathy. Asymmetrical gait is the hallmark in arthralgia, hip prosthesis, or hemiparesis. Parkinson’s disease gait disturbance may resemble the INPH gait. WHAT ARE THE SPECIALISTS DOING? After confirmation of the diagnosis, the next question is whether or not the patient is likely to benefit from a shunt. Few neurosurgeons base their decision on just the clinical picture—predictive tests are used in patients with the clinical diagnosis of INPH and are also helpful in selecting borderline cases not entirely fulfilling the diagnostic criteria. The tests can roughly be divided into two categories: those that aim to measure parameters characterising the CSF dynamic system, and CSF removal tests that simulate shunting. Unfortunately many predictive tests lack validation, and an important problem in some studies is that the patients were included on the basis of the predictive test under study. Furthermore, many studies included only clinically typical cases whereas most of the patients admitted for assessment are less typical. A radioactive isotope is injected via a lumbar puncture into the subarachnoid space and using a gamma camera the speed and flow direction of the isotope are observed. Normally, the isotope flowing with the CSF accumulates over the cortical surface. In INPH, where there is thought to be retrograde flow, accumulation of the isotope in the ventricles is anticipated. This method was once very popular but in 1992 a review concluded that “cisternography does not improve the diagnostic accuracy”61 and there has been little interest since then. It is generally believed that the outflow resistance (Rout) (or the inverse, CSF outflow conductance) is the clinically most important CSF dynamic parameter. Determination of Rout can be considered as a “three-in-one investigation”: as a diagnostic tool, a prognostic test, and a technique to check CSF shunt function. The Rout is increased in INPH patients compared to healthy adults6 and to patients with Alzheimer’s disease or vascular dementia63 (fig 4). It has been stated that if the outflow resistance exceeds a certain threshold, this is an excellent predictor of surgical outcome.24 However today there is a lack of consensus concerning the usefulness of this measure, with some studies supporting Rout3, 12, 64 and others finding it less useful in the selection process.6 The methodological issues discussed above can explain some of this discrepancy. Furthermore, an INPH patient in an irreversible stage of disease can have pathological resistance but not be shunt responsive. Example of intracranial pressure (ICP) recording. In the 8–15 minute interval typical b-waves are shown. Simulation of the effect of shunting by draining CSF is another approach to predict outcome after surgery. 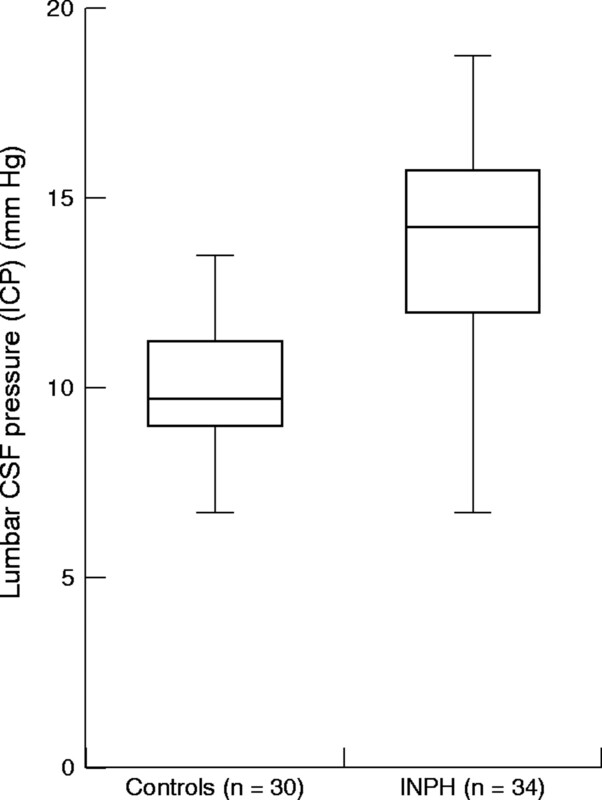 This type of test was first described by Wikkelsö 68 and is done by measuring psychometric function and gait pattern before and after draining 40–50 ml of CSF at lumbar puncture. It is easy, safe, and inexpensive, and is probably the most commonly used test to identify patients suitable for shunting.69 But although the positive predictive value is high, there are still a considerable number of patients who can improve after shunting in spite of a negative tap test.64 A European multicentre study is ongoing and will hopefully provide data on the reliability of this test. False negative CSF tap tests (that is, the patient improves after surgery, despite a negative tap test) are seen in most studies, which has lead to the hypothesis that the test would be more reliable if a larger volume of CSF was removed over several days, imitating a CSF shunt. For continuous CSF drainage a catheter is placed in the lumbar CSF space for 2–4 days and 150–250 ml is removed each day. This is expensive because the patient has to stay in hospital for several days, there is a risk of meningitis,3,70 and catheter related problems are not uncommon (blockage or catheter withdrawn by a confused patient). Although this method has been considered as a valuable predictive test3 the scientific support is weak, with two positive studies3,71 and one negative.70 A well designed multicentre study is needed. An MRI is necessary to confirm communicating hydrocephalus (that is, to exclude obstruction of the CSF pathways) and to quantify the severity of any white matter lesions and atrophy. These abnormalities do not necessarily predict a poor outcome from surgery38,74–76 but if they are very obvious it is our opinion that there must be other strong reasons to justify shunting, for instance high CSF outflow resistance and improvement after CSF drainage. Different centres investigate patients in different ways and the surgical indications vary, but generally clinically typical patients are shunted, while more attention has to be paid to the risk-benefit balance in atypical cases. 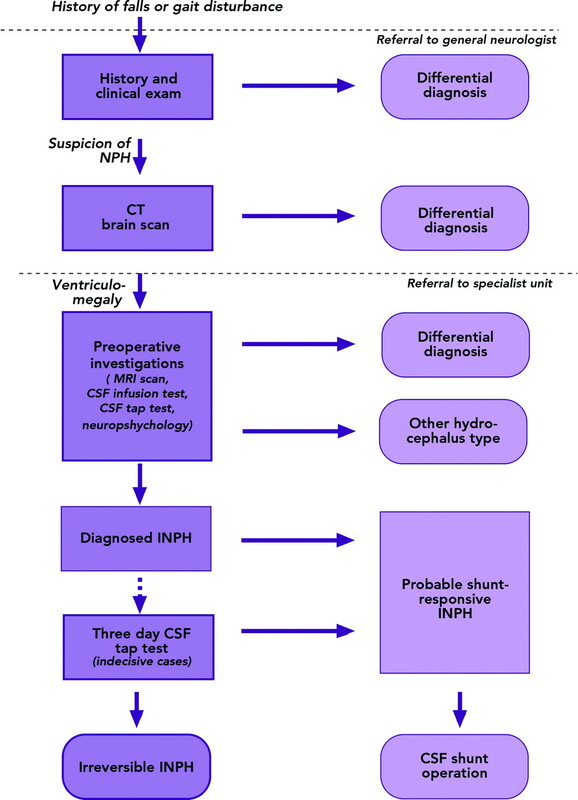 In summary, the investigative process in our hospital for diagnosing INPH and selecting shunt candidates includes history and clinical examination, MRI scan, CSF outflow resistance measurement including CSF tap test, and in a few patients long term CSF removal (Fig 6). Flow diagram describing the investigational process used in Umeå for diagnosing INPH and selecting shunt candidates. Boxes with rounded corners indicates endpoints of the INPH investigation. WHAT IS A CSF SHUNT DOING? A shunt consists at least of a ventricular (proximal) catheter, a shunt housing with a valve mechanism, and a distal catheter for outlet, most often into the abdominal cavity (fig 7). 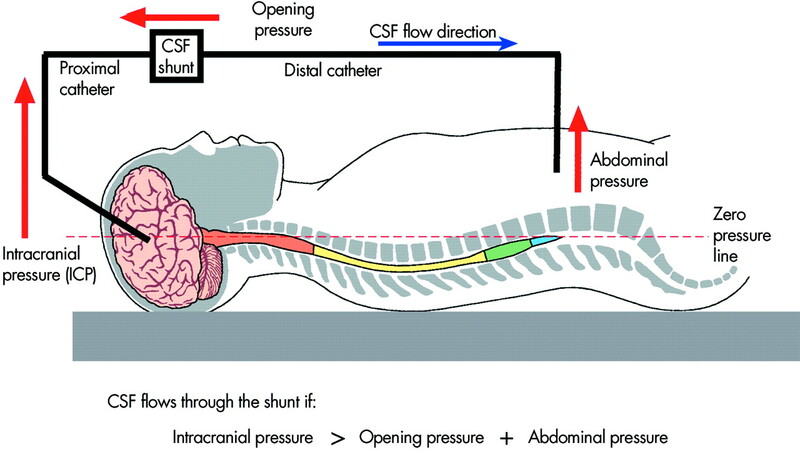 Most of the CSF shunts currently on the market are of the differential pressure type: the opening pressure (Pop) of a shunt states the differential pressure across the shunt at which the valve opens. A standard CSF shunt system. The CSF is diverted from the ventricles, through the shunt valve and into the peritoneal cavity. where Rsh is the flow resistance of the shunt system. This relation assumes that the shunt is open—that is, that differential pressure exceeds the opening pressure of the shunt (ICP − Ppc > Pop), and that the Rsh is much smaller than the outflow resistance of the normal pathways. It is possible to evaluate CSF shunt characteristics postoperatively using a CSF infusion method.81 Postoperative CSF outflow resistance remains remarkably stable, and much lower than at baseline (that is, preoperative investigation showing resistance of normal pathways) in patients with functioning CSF shunts. ICP also remains stable, but similar to the preoperative value. In the upright position the situation becomes more complicated. There is a hydrostatic siphoning effect from the vertical CSF column between the ventricle of the brain and the outlet at the abdominal cavity (a similar principle as siphoning aquarium water). This siphoning can cause overdrainage and modern shunts therefore often include an anti-siphoning device to eliminate this problem. Another common feature of modern shunts is an adjustable opening pressure valve—that is, an externally applied magnetic field changes a spring mechanism, thus increasing or decreasing the opening pressure of the CSF shunt. By way of this the properties of the shunt system can be tuned postoperatively if the clinical outcome is not satisfactory. Following CSF shunting, a follow up visit is important (table 4) to evaluate whether an unchanged or worsened patient can be helped by shunt adjustment and to discover any cases of shunt dysfunction requiring surgical revision. It is also possible that even an improved patient could benefit more with better adjustment of the shunt. Gait, cognition, and activities of daily living should be evaluated with standardised scales. Video recording of gait is an excellent method to compare the baseline and post shunting states. A CT brain scan will exclude a subdural haematoma caused by overdrainage, as this can be asymptomatic. Compared with preoperative images, unchanged width of the ventricles despite clinical improvement is a common finding, and it is important to note that the width of the ventricles does not reflect the function of the CSF shunt.82,83 Sometimes widening of the cortical fissures is more pronounced postoperatively (fig 3). The CT scan also reveals the location of the proximal (or ventricular) catheter, which should usually be in the right frontal horn (fig 3). Blood samples are drawn to check for signs of infection. If CSF is available it should also be analysed. There is no contraindication to lumbar puncture in a patient with a CSF shunt because of communicating hydrocephalus. Puncture of the shunt valve should be avoided, but may be indicated if there is suspicion of CSF shunt infection or dysfunction, but only after discussion with a hydrocephalus specialist. Inspect the CSF shunt valve (usually behind or above right ear) as well as the tubing (fracture? skin infection?). 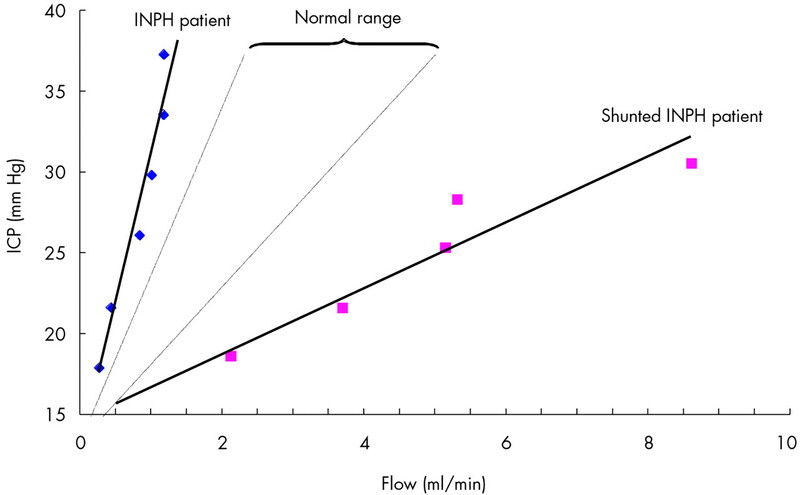 Pumping the valve gives a rough estimate of shunt function (fig 8). If the valve does not refill after compression, there is probably shunt dysfunction (usually obstruction in the proximal catheter). On the other hand, “normal” pumping and refilling of the valve does not guarantee a functioning CSF shunt. Pre- and postoperative evaluation with a CSF infusion method. The slope of the regression lines corresponds to the outflow resistance, Rout. Normal Rout slopes are shown by dotted lines. This INPH patient had a typical pattern with a higher than normal Rout preoperatively, which changed to a lower than normal Rout after shunting. With modern, adjustable, or manoeuverable CSF shunts, it is possible to modify the opening pressure postoperatively. A new field of research is to evaluate whether patients showing improvement can improve further through lowering or increasing the opening pressure. Also, a small subdural haematoma can be treated by increasing the opening pressure, thus avoiding a neurosurgical operation.88 Adjusting the opening pressure of the CSF shunt requires frequent follow up visits and careful monitoring of the patient in between. Modern CSF shunts are easy to handle and require minimal training to learn how to adjust. Common causes are obstruction (of the ventricular catheter, shunt valve, or abdominal catheter), fracture of the tubing, displacement of the catheter tips, or incorrect setting on an adjustable shunt. In patients with a nonfunctioning shunt the symptoms will reappear or become aggravated but in INPH they are never dramatic, in contrast to obstructive forms of hydrocephalus. In a standard CSF shunt system, there is always some gravity induced flow (siphon effect). Even if a system with antisiphon properties is used, this mechanism can fail and cause overdrainage. Symptoms related to overdrainage are very variable, from a mild headache to life threatening intracranial bleeding. The most common symptom is a posture related headache (similar to post lumbar puncture headache), worse when the patient is sitting or standing, and relieved when lying down. Infections are most commonly caused by Staphylococcus aureus or epidermidis and they usually present during the first year after the operation. The patient has general signs of infection with malaise, nausea, vomiting, fever, leucocytosis, and an increased blood CRP. The symptoms are often vague, and so an infection should be sought in all CSF shunt patients presenting with a non-specific clinical picture. Follow the catheter and look for signs of skin infection or tenderness, or pain in the abdomen. As a result of the infection, the shunt valve can stop functioning, giving the patient symptoms of underdrainage. Besides antibiotics, treatment often requires removal of the CSF shunt system. Hydrocephalus is a common disorder and its reversibility, by means of a CSF shunt, justifies increased awareness among neurologists. A multidisciplinary approach together with a neurosurgeon is recommended. Dilated ventricles, impaired balance, and gait disturbance are the cardinal features. Mental impairment and/or urinary symptoms may also occur. INPH is increasingly recognised as caused by a complex interaction between a CSF dynamic disturbance and cerebrovascular disease. The most important predictive tests are CSF outflow resistance/conductance and a CSF tap test. Today, 70–80% of patients operated on with a CSF shunt improve postoperatively. The neurologist should learn how to recognise the signs and symptoms of a shunt complication, as well as how to adjust the opening pressure of the shunt. A lumbar infusion test is the gold standard for testing shunt function in patients with communicating hydrocephalus. The authors wish to thank Bo Kristensen, Lars Johan Liedholm, and Aina Ågren-Wilsson for helpful discussion and comments on the text of this article. The article was reviewed by Professor Ian Whittle, Edinburgh, UK. Trenkwalder C, Schwarz J, Gebhard J, et al. Starnberg trial on epidemiology of Parkinsonism and hypertension in the elderly. Prevalence of Parkinson’s disease and related disorders assessed by a door-to-door survey of inhabitants older than 65 years. Arch Neurol 1995;52:1017–22. Tisell M, Hoglund M, Wikkelso C. National and regional incidence of surgery for adult hydrocephalus in Sweden. Acta Neurol Scand 2005;112:72–5. Marmarou A, Young HF, Aygok GA, et al. Diagnosis and management of idiopathic normal-pressure hydrocephalus: a prospective study in 151 patients. J Neurosurg 2005;102:987–97. Hakim S, Adams RD. The special clinical problem of symptomatic hydrocephalus with normal cerebrospinal fluid pressure. Observations on cerebrospinal fluid hydrodynamics. J Neurol Sci 1965;2:307–27. Shenkin HA, Greenberg JO, Grossman CB. Ventricular size after shunting for idiopathic normal pressure hydrocephalus. J Neurol Neurosurg Psychiatry 1975;38:833–7. Malm J, Kristensen B, Karlsson T, et al. The predictive value of cerebrospinal fluid dynamic tests in patients with th idiopathic adult hydrocephalus syndrome. Arch Neurol 1995;52:783–9. Gjerris F, Borgesen SE, Sorensen PS. Outflow of cerebrospinal fluid. Copenhagen: Munksgaard, 1989. Esmonde T, Cooke S. Shunting for normal pressure hydrocephalus (NPH). Cochrane Database Syst Rev 2002:CD003157. Bergsneider M, Black PM, Klinge P, et al. Surgical Management of idiopathic normal-pressure hydrocephalus. Neurosurgery 2005;57(Suppl 3):S29–39. Vanneste J, Augustijn P, Dirven C, et al. Shunting normal-pressure hydrocephalus: do the benefits outweigh the risks? A multicenter study and literature review. Neurology 1992;42:54–9. Larsson A, Wikkelso C, Bilting M, et al. Clinical parameters in 74 consecutive patients shunt operated for normal pressure hydrocephalus. Acta Neurol Scand 1991;84:475–82. Boon AJ, Tans JT, Delwel EJ, et al. Dutch normal-pressure hydrocephalus study: prediction of outcome after shunting by resistance to outflow of cerebrospinal fluid. J Neurosurg 1997;87:687–93. Bech-Azeddine R, Waldemar G, Knudsen GM, et al. Idiopathic normal-pressure hydrocephalus: evaluation and findings in a multidisciplinary memory clinic. Eur J Neurol 2001;8:601–11. Savolainen S, Hurskainen H, Paljarvi L, et al. Five-year outcome of normal pressure hydrocephalus with or without a shunt: predictive value of the clinical signs, neuropsychological evaluation and infusion test. Acta Neurochir (Wien) 2002;144:515–23; discussion 523. Thomsen AM, Borgesen SE, Bruhn P, et al. Prognosis of dementia in normal-pressure hydrocephalus after a shunt operation. Ann Neurol 1986;20:304–10. Duinkerke A, Williams MA, Rigamonti D, et al. Cognitive recovery in idiopathic normal pressure hydrocephalus after shunt. Cogn Behav Neurol 2004;17:179–84. Raftopoulos C, Deleval J, Chaskis C, et al. Cognitive recovery in idiopathic normal pressure hydrocephalus: a prospective study. Neurosurgery 1994;35:397–404; discussion 404–5. Klinge P, Ruckert N, Schuhmann M, et al. Neuropsychological testing to improve surgical management of patients with chronic hydrocephalus after shunt treatment. Acta Neurochir Suppl 2002;81:51–3. Malm J, Kristensen B, Stegmayr B, et al. Three-year survival and functional outcome of patients with idiopathic adult hydrocephalus syndrome. Neurology 2000;55:576–8. Tsunoda A, Mitsuoka H, Bandai H, et al. Intracranial cerebrospinal fluid measurement studies in suspected idiopathic normal pressure hydrocephalus, secondary normal pressure hydrocephalus, and brain atrophy. J Neurol Neurosurg Psychiatry 2002;73:552–5. Fishman R. Cerebrospinal fluid in diseases of the nervous system. Philadelphia: Saunders Company, 1992. Kimelberg HK. Water homeostasis in the brain: basic concepts. Neuroscience 2004;129:851–60. Edsbagge M, Tisell M, Jacobsson L, et al. Spinal CSF absorption in healthy individuals. Am J Physiol Regul Integr Comp Physiol 2004;287:R1450–5. Borgesen SE, Gjerris F. The predictive value of conductance to outflow of CSF in normal pressure hydrocephalus. Brain 1982;105:65–86. Lundkvist B, Eklund A, Kristensen B, et al. Cerebrospinal fluid hydrodynamics after placement of a shunt with an antisiphon device: a long-term study. J Neurosurg 2001;94:750–6. Hakim S, Venegas JG, Burton JD. The physics of the cranial cavity, hydrocephalus and normal pressure hydrocephalus: mechanical interpretation and mathematical model. Surg Neurol 1976;5:187–210. Larsson A. Normal pressure hydrocephalus: pathophysiological, clinical and diagnostic aspects. Gothenburg: Gothenburg university, 1993. Silverberg GD, Mayo M, Saul T, et al. Alzheimer’s disease, normal-pressure hydrocephalus, and senescent changes in CSF circulatory physiology: a hypothesis. Lancet Neurol 2003;2:506–11. Krefft TA, Graff-Radford NR, Lucas JA, et al. Normal pressure hydrocephalus and large head size. Alzheimer Dis Assoc Disord 2004;18:35–7. Bradley WG, Safar FG, Hurtado C, et al. Increased intracranial volume: a clue to the etiology of idiopathic normal-pressure hydrocephalus? AJNR Am J Neuroradiol 2004;25:1479–84. Bradley WG Jr, Whittemore AR, Kortman KE, et al. 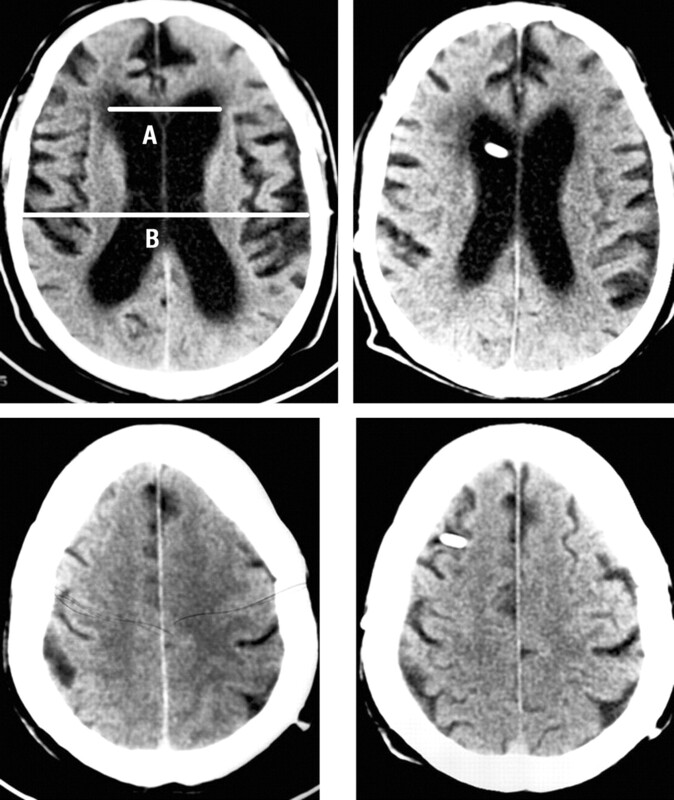 Marked cerebrospinal fluid void: indicator of successful shunt in patients with suspected normal-pressure hydrocephalus. Radiology 1991;178:459–66. Pettorossi VE, Di Rocco C, Mancinelli R, et al. Communicating hydrocephalus induced by mechanically increased amplitude of the intraventricular cerebrospinal fluid pulse pressure: rationale and method. Exp Neurol 1978;59:30–9. Bateman GA. Pulse wave encephalopathy: a spectrum hypothesis incorporating Alzheimer’s disease, vascular dementia and normal pressure hydrocephalus. Med Hypotheses 2004;62:182–7. Agren-Wilsson A. On the pathophysiology of idiopathic adult hydrocephalus syndrome. Energy metabolism, protein patterns and intracranial pressure. Umeå: Umeå University, 2005. Stolze H, Kuhtz-Buschbeck JP, Drucke H, et al. Comparative analysis of the gait disorder of normal pressure hydrocephalus and Parkinson’s disease. J Neurol Neurosurg Psychiatry 2001;70:289–97. Krauss JK, Regel JP, Vach W, et al. Vascular risk factors and arteriosclerotic disease in idiopathic normal-pressure hydrocephalus of the elderly. Stroke 1996;27:24–9. Graff-Radford NR, Godersky JC. Idiopathic normal pressure hydrocephalus and systemic hypertension. Neurology 1987;37:868–71. Kristensen B, Malm J, Fagerland M, et al. Regional cerebral blood flow, white matter abnormalities, and cerebrospinal fluid hydrodynamics in patients with idiopathic adult hydrocephalus syndrome. J Neurol Neurosurg Psychiatry 1996;60:282–8. Boon AJ, Tans JT, Delwel EJ, et al. Dutch Normal-Pressure Hydrocephalus Study: the role of cerebrovascular disease. J Neurosurg 1999;90:221–6. Tullberg M, Jensen C, Ekholm S, et al. Normal pressure hydrocephalus: vascular white matter changes on MR images must not exclude patients from shunt surgery. AJNR Am J Neuroradiol 2001;22:1665–73. Tanaka A, Kimura M, Nakayama Y, et al. Cerebral blood flow and autoregulation in normal pressure hydrocephalus. Neurosurgery 1997;40:1161–5; discussion 1165–7. Momjian S, Czosnyka Z, Czosnyka M, et al. Link between vasogenic waves of intracranial pressure and cerebrospinal fluid outflow resistance in normal pressure hydrocephalus. Br J Neurosurg 2004;18:56–61. Agren-Wilsson A, Eklund A, Koskinen LO, et al. Brain energy metabolism and intracranial pressure in idiopathic adult hydrocephalus syndrome. J Neurol Neurosurg Psychiatry 2005;76:1088–93. Graff-Radford NR, Godersky JC. Normal-pressure hydrocephalus. Onset of gait abnormality before dementia predicts good surgical outcome. Arch Neurol 1986;43:940–2. Graff-Radford NR, Godersky JC, Jones MP. Variables predicting surgical outcome in symptomatic hydrocephalus in the elderly. Neurology 1989;39:1601–4. Stolze H, Kuhtz-Buschbeck JP, Drucke H, et al. Gait analysis in idiopathic normal pressure hydrocephalus—which parameters respond to the CSF tap test? Clin Neurophysiol 2000;111:1678–86. Kuba H, Inamura T, Ikezaki K, et al. Gait disturbance in patients with low pressure hydrocephalus. J Clin Neurosci 2002;9:33–6. Blomsterwall E, Bilting M, Stephensen H, et al. Gait abnormality is not the only motor disturbance in normal pressure hydrocephalus. Scand J Rehabil Med 1995;27:205–9. Krauss JK, Regel JP, Droste DW, et al. Movement disorders in adult hydrocephalus. Mov Disord 1997;12:53–60. Miyoshi N, Kazui H, Ogino A, et al. Association between cognitive impairment and gait disturbance in patients with idiopathic normal pressure hydrocephalus. Dement Geriatr Cogn Disord 2005;20:71–6. Golomb J, Wisoff J, Miller DC, et al. Alzheimer’s disease comorbidity in normal pressure hydrocephalus: prevalence and shunt response. J Neurol Neurosurg Psychiatry 2000;68:778–81. Gallassi R, Morreale A, Montagna P, et al. Binswanger’s disease and normal-pressure hydrocephalus. Clinical and neuropsychological comparison. Arch Neurol 1991;48:1156–9. Merten T. [Neuropsychology of normal pressure hydrocephalus]. Nervenarzt 1999;70:496–503. Cummings J. Introduction. In: Cummings J, ed. Subcortical dementia. New York: Oxford University Press, 1990:3–16. Iddon JL, Pickard JD, Cross JJ, et al. Specific patterns of cognitive impairment in patients with idiopathic normal pressure hydrocephalus and Alzheimer’s disease: a pilot study. J Neurol Neurosurg Psychiatry 1999;67:723–32. Tullberg M, Hellstrom P, Piechnik SK, et al. Impaired wakefulness is associated with reduced anterior cingulate CBF in patients with normal pressure hydrocephalus. Acta Neurol Scand 2004;110:322–30. Bradley WG Jr. Diagnostic tools in hydrocephalus. Neurosurg Clin N Am 2001;12:661–84, viii. Boon AJ, Tans JT, Delwel EJ, et al. The Dutch normal-pressure hydrocephalus study. How to select patients for shunting? An analysis of four diagnostic criteria. Surg Neurol 2000;53:201–7. Holodny AI, George AE, de Leon MJ, et al. Focal dilation and paradoxical collapse of cortical fissures and sulci in patients with normal-pressure hydrocephalus. J Neurosurg 1998;89:742–7. Tisell M, Tullberg M, Hellstrom P, et al. Neurological symptoms and signs in adult aqueductal stenosis. Acta Neurol Scand 2003;107:311–17. Vanneste J, Augustijn P, Davies GA, et al. Normal-pressure hydrocephalus. Is cisternography still useful in selecting patients for a shunt? Arch Neurol 1992;49:366–70. Andersson N, Malm J, Bäcklund T, et al. Assessment of cerebrospinal outflow conductance using constant-pressure infusion—a method with real time estimation of reliability. Physiol Meas 2005;26:1137–48. Malm J, Kristensen B, Kompuniemi J, et al. The contribution of clinical and CSF hydrodynamic factors to arachnoidal villi function. In: Ninth international symposium on intracranial pressure and its related problems. Nagoya: 1994:O-07–38. Kahlon B, Sundbarg G, Rehncrona S. Comparison between the lumbar infusion and CSF tap tests to predict outcome after shunt surgery in suspected normal pressure hydrocephalus. J Neurol Neurosurg Psychiatry 2002;73:721–6. Lenfeldt N, Andersson N, Agren-Wilsson A, et al. 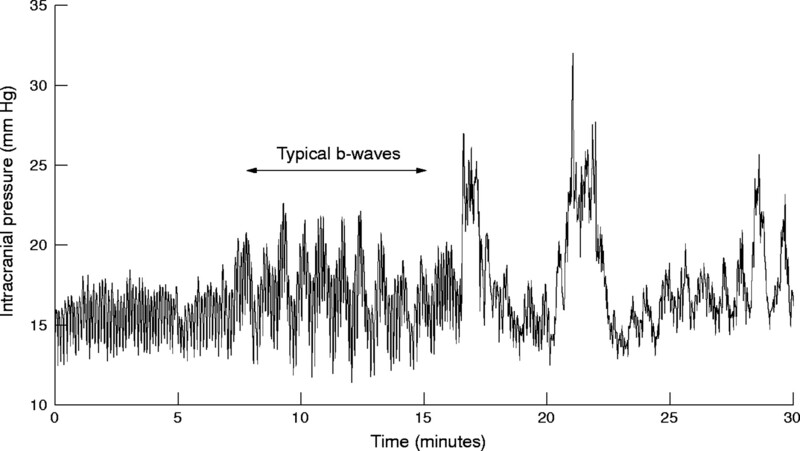 Cerebrospinal fluid pulse pressure method: a possible substitute for the examination of B waves. J Neurosurg 2004;101:944–50. Eklund A, Agren-Wilsson A, Andersson N, et al. Two computerized methods used to analyze intracranial pressure B waves: comparison with traditional visual interpretation. J Neurosurg 2001;94:392–6. Stephensen H, Andersson N, Eklund A, et al. Objective B wave analysis in 55 patients with non-communicating and communicating hydrocephalus. J Neurol Neurosurg Psychiatry 2005;76:965–70. Wikkelso C, Andersson H, Blomstrand C, et al. Normal pressure hydrocephalus. Predictive value of the cerebrospinal fluid tap-test. Acta Neurol Scand 1986;73:566–73. Vanneste J, van Acker R. Normal pressure hydrocephalus: did publications later management? J Neurol Neurosurg Psychiatry 1990;53:564–8. Walchenbach R, Geiger E, Thomeer RT, et al. The value of temporary external lumbar CSF drainage in predicting the outcome of shunting on normal pressure hydrocephalus. J Neurol Neurosurg Psychiatry 2002;72:503–6. Williams MA, Razumovsky AY, Hanley DF. Comparison of Pcsf monitoring and controlled CSF drainage diagnose normal pressure hydrocephalus. Acta Neurochir Suppl 1998;71:328–30. Klinge P, Berding G, Brinker T, et al. Regional cerebral blood flow profiles of shunt-responder in idiopathic chronic hydrocephalus—a 15-O-water PET-study. Acta Neurochir Suppl 2002;81:47–9. Owler BK, Pickard JD. Normal pressure hydrocephalus and cerebral blood flow: a review. Acta Neurol Scand 2001;104:325–42. Bradley WG Jr, Whittemore AR, Watanabe AS, et al. Association of deep white matter infarction with chronic communicating hydrocephalus: implications regarding the possible origin of normal-pressure hydrocephalus. AJNR Am J Neuroradiol 1991;12:31–9. Tullberg M, Hultin L, Ekholm S, et al. White matter changes in normal pressure hydrocephalus and Binswanger disease: specificity, predictive value and correlations to axonal degeneration and demyelination. Acta Neurol Scand 2002;105:417–26. Bradley WG Jr, Kortman KE, Burgoyne B. Flowing cerebrospinal fluid in normal and hydrocephalic states: appearance on MR images. Radiology 1986;159:611–16. Dixon GR, Friedman JA, Luetmer PH, et al. Use of cerebrospinal fluid flow rates measured by phase-contrast MR to predict outcome of ventriculoperitoneal shunting for idiopathic normal-pressure hydrocephalus. Mayo Clin Proc 2002;77:509–14. Bradley WG. Cerebrospinal fluid dynamics and shunt responsiveness in patients with normal-pressure hydrocephalus. Mayo Clin Proc 2002;77:507–8. Drake JM, Kestle JR, Milner R, et al. Randomized trial of cerebrospinal fluid shunt valve design in pediatric hydrocephalus. Neurosurgery 1998;43:294–303; discussion 303–5. Malm J, Lundkvist B, Eklund A, et al. CSF outflow resistance as predictor of shunt function. A long-term study. Acta Neurol Scand 2004;110:154–60. Iskandar BJ, McLaughlin C, Mapstone TB, et al. Pitfalls in the diagnosis of ventricular shunt dysfunction: radiology reports and ventricular size. Pediatrics 1998;101:1031–6. Meier U, Paris S, Grawe A, et al. Is decreased ventricular volume a correlate of positive clinical outcome following shunt placement in cases of normal pressure hydrocephalus? Acta Neurochir Suppl 2003;86:533–7. Czosnyka ZH, Czosnyka M, Pickard JD. Shunt testing in-vivo: a method based on the data from the UK shunt evaluation laboratory. Acta Neurochir Suppl 2002;81:27–30. Eklund A, Lundkvist B, Koskinen LO, et al. Infusion technique can be used to distinguish between dysfunction of a hydrocephalus shunt system and a progressive dementia. Med Biol Eng Comput 2004;42:644–9. Malm J, Kristensen B, Fagerlund M, et al. Cerebrospinal fluid shunt dynamics in patients with idiopathic adult hydrocephalus syndrome. J Neurol Neurosurg Psychiatry 1995;58:715–23. Greenberg M. Handbook of neurosurgery. Fifth edition ed. New York: Thieme Medical Publishers, 2001. Kay AD, Fisher AJ, O’Kane C, et al. A clinical audit of the Hakim programmable valve in patients with complex hydrocephalus. Br J Neurosurg 2000;14:535–42. O’Kane MC, Richards H, Winfield P, et al. The United Kingdom Shunt Registry. Eur J Pediatr Surg 1997;7(Suppl 1):56. Zemack G, Romner B. Adjustable valves in normal-pressure hydrocephalus: a retrospective study of 218 patients. Neurosurgery 2002;51:1392–400; discussion 1400–2. Hanlo PW, Cinalli G, Vandertop WP, et al. Treatment of hydrocephalus determined by the European Orbis Sigma Valve II survey: a multicenter prospective 5-year shunt survival study in children and adults in whom a flow-regulating shunt was used. J Neurosurg 2003;99:52–7. Corkill RG, Garnett MR, Blamire AM, et al. Multi-modal MRI in normal pressure hydrocephalus identifies pre-operative haemodynamic and diffusion coefficient changes in normal appearing white matter correlating with surgical outcome. Clin Neurol Neurosurg 2003;105:193–202. Agren-Wilsson A, Roslin M, Eklund A, et al. Intracerebral microdialysis and CSF hydrodynamics in idiopathic adult hydrocephalus syndrome. J Neurol Neurosurg Psychiatry 2003;74:217–21. Vorstrup S, Christensen J, Gjerris F, et al. Cerebral blood flow in patients with normal-pressure hydrocephalus before and after shunting. J Neurosurg 1987;66:379–87. Momjian S, Owler BK, Czosnyka Z, et al. Pattern of white matter regional cerebral blood flow and autoregulation in normal pressure hydrocephalus. Brain 2004;127:965–72. Owler BK, Momjian S, Czosnyka Z, et al. Normal pressure hydrocephalus and cerebral blood flow: a PET study of baseline values. J Cereb Blood Flow Metab 2004;24:17–23. Del Bigio MR, Zhang YW. Cell death, axonal damage, and cell birth in the immature rat brain following induction of hydrocephalus. Exp Neurol 1998;154:157–69. Chumas PD, Drake JM, Del Bigio MR, et al. Anaerobic glycolysis preceding white-matter destruction in experimental neonatal hydrocephalus. J Neurosurg 1994;80:491–501. Tullberg M, Rosengren L, Blomsterwall E, et al. CSF neurofilament and glial fibrillary acidic protein in normal pressure hydrocephalus. Neurology 1998;50:1122–7. Agren-Wilsson A, Lekman A, Rosengren L, et al. Cerebrospinal fluid biochemical markers in the evaluation of idiopathic adult hydrocephalus syndrome. In Ågren Wilsson A. Medical dissertation. Umeå university, 2005.